It's really easy to spend a lot of money during the holidays—between all of the food, decorations, and gifts, costs can add up quickly. However, there are many ways to enjoy the Christmas season without ruining your budget, especially if you attend these free holiday events and celebrations in the St. Louis area. From wandering through well-decorated holiday houses to checking out the holiday lighting displays around the region, the following events and celebrations are completely free of charge and open to one and all this year. Also, if you don't mind spending a little cash, these 35 popular holiday events are worth the price of admission, and are certain to bring a little extra joy to your Christmas season. The Brewery Lights will kick off the holidays with a public lighting ceremony on Nov. 15 at 5:30 p.m. and then will be open every Thursday - Sunday through December 30, 2018, from 5 p.m. - 10 p.m. The brewery is hosting free walking tours, along with free samples of AB products during Brewery Lights. Walking tours are not available on Thanksgiving, Christmas Eve, Christmas and New Year's Eve. Get in the holiday spirit at the annual Christmas Tree Lighting in Alton, then stick around to drive through the "Christmas Wonderland" of two and a half million lights they're hosting throughout December at Rock Springs Park. For the Tree Lighting Ceremony, though, everyone gathers at Lincoln-Douglas Square for caroling and the lighting of the community Christmas tree. Visitors can enjoy free cookies and hot chocolate, and free pictures with Santa. The event is held each year from 6 p.m. to 8 p.m. on the Friday before Thanksgiving. Celebrate the beginning of the holiday season in St. Peters with the annual tree lighting and Christmas celebration, hosted on the Friday of Thanksgiving. The event begins at City Hall at 6:30 p.m. and there will be musical performances, a visit from Santa, and plenty activities for the kids. If you want to visit after the Thanksgiving holidays, you can also check out the Tilles Park Lights all season long. There's plenty of free fun at the Amerin Missouri Holiday Festival of Lights in downtown St. Louis. 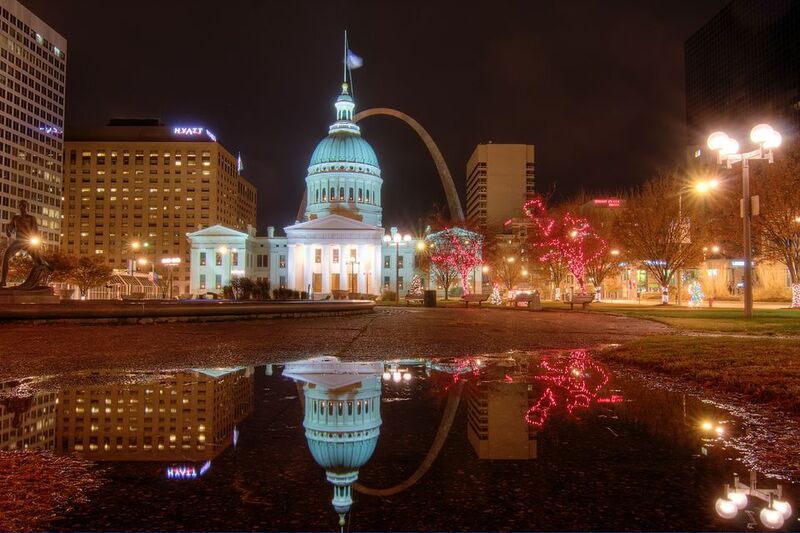 Kiener Plaza is the place to be this year for the lighting of the downtown Christmas tree and light display. The celebration also includes a visit from Santa Claus and fireworks. The event runs from 4:00 p.m. until 8:30 p.m. on November 17, 2018. The Way of Lights at Our Lady of the Snows Shrine in Belleville is one of the area's biggest Christmas light displays—and it's free! More than a million lights are used to tell the story of Jesus' birth. The Way of Lights is open Friday, November 16, 2018 – Tuesday, January 1, 2019. The drive-through outdoor light displays are open every night, including Thanksgiving, Christmas Eve, Christmas Day, and New Year's Eve, but the Shrine's restaurant and gift shop are closed on the holidays. For thousands of St. Louisans, Thanksgiving begins downtown at the annual Ameren Missouri Thanksgiving Day parade. Marching bands, floats, giant balloons and more make their way down Market Street beginning at 8:45 a.m. on Thanksgiving Day itself. On November 23, Belleville welcomes the holiday season with a Santa Parade down Main Street. The parade features more than 100 units including marching bands, floats, and dance troupes beginning at 10 a.m. and lasting into the early afternoon. For 2018 only there is a change in the parade route due to street improvements being made. In the past, the parade has started at 17th and West Main streets. This year, the parade will begin at Third and West Main streets and end at Oak and East Main streets. The Old Courthouse in Downtown St. Louis will be decked out in Victorian style for the holidays. This year's decorations will be unveiled the Friday after Thanksgiving, and admission to tour the courthouse is free. So if you're interested in seeing some holiday lights and getting a bit of an insider look at St. Louis history, this is definitely worth checking out. From November 23 through December 24, celebrate Christmas the old-fashioned way on Main Street in historic St. Charles. You'll see carolers and beautiful decorations every weekend as you make your way down this historic district. On Wednesdays, Fridays, and Saturdays, all the shops and restaurants stay open until 9 p.m. to accommodate holiday guests. The Bethalto Christmas Village is a free, family-friendly event in Bethalto's Central Park. Stroll through Christmas themed cottages, enjoy live music, and see a live nativity scene on select evenings from 5 p.m. to 9 p.m. November ​24 through December 16, 2018. Join residents and visitors in the St. Louis Hills neighborhood for the lighting of the Francis Park Christmas tree. The towering tree is located along Nottingham Avenue near Childress, and the event is from 7 p.m. to 9 p.m. on the Sunday after Thanksgiving. The holiday party will take place December 2 and feature dinner, drinks, and community engagement for a standard price to cover costs and raise funds for community initiatives. The Metro East community of Lebanon, Illinois, hosts a free Christmas light display in Horner Park each year. This year from November 16 through December 31, colorful lights and hand-painted scenes will be used to create a Victorian style holiday show for the whole family. The drive-through display is open Sunday through Thursday from 5 p.m. to 9 p.m., and Friday and Saturday from 5 p.m. to 10 p.m. Admission is free, but donations are accepted. The Jewel Box in Forest Park is beautiful any time of the year but really shines during the holidays. During the Christmas season, the giant greenhouse is filled with red, pink, and white poinsettias in honor of the holidays. You can take in the display Monday through Friday from 9 a.m. to 4 p.m., Saturday from 9 a.m. to 11 a.m., and Sunday from 9 a.m. to 2 p.m., and admission is free Monday and Tuesday before noon. The Jewel Box is located at the intersection of Wells and McKinley in Forest Park. Bring your camera and take free photos with Santa Claus at the historic train station in Kirkwood on December 6, 13, and 14, 2018. Then, after you're done telling Santa your Christmas list, walk through downtown and see all the holiday decorations and lights that the rest of historic Kirkwood has to offer. The annual Christmas Tree Walk features caroling, the lighting of the town tree, and visits from Santa as well as a contest of neighborhood window displays. There are also carriage rides for a $5. They have free hot chocolate to warm you up. The celebration runs from 6 p.m. to 9 p.m. in downtown Maplewood on December 7, 2018. After the event, check back at the Maplewood website for window display winners and then go check them out in a driving tour of lights in the area. The cold weather is just the right setting for the Snowflake Festival in Godfrey, Illinois. This free, old-fashioned festival features carriage rides, caroling, hot cocoa, and pictures with Santa. Everyone is asked to bring a non-perishable food item to donate, but the event itself is free. The Snowflake Festival runs from 6 to 8 p.m. on Friday, December 7, 2018, at Glazebrook Park. The U.S. Air Force Band of Mid-America performs a series of free holiday concerts in St. Louis and the Metro East every year. The concerts are free, but you do need to get complimentary tickets in advance. For more on getting tickets online, see the USAF Band of Mid-America website. Dates this year run December 8 through 15, 2018. On December 2, UMSL’s Jazz Ensemble performs holiday favorites during its annual free concert at the Touhill Performing Arts Center. The concert begins at 3 p.m. and features some of the best jazz standards to put you in the holiday mood. The St. Louis Art Museum will explore winter holidays from around the world at its Winter Festival Weekend. The event includes entertainment, live performances, treats, and art activities and runs from Friday, December 8 through Sunday, December 9, 2018, from 10 a.m. to 4 p.m. Experience a Victorian Christmas in Bethalto, Illinois at the Victorian Christmas Walk. The event, held this year on Sunday, December 9, includes carriage rides, bell choirs, and strolling musicians. There's also a visit from Father Christmas, holiday treats, and free Christmas concerts from 3 p.m. to 7 p.m. The Christmas Walk is held at the Bethalto Village Center near Village Hall. 92.3 WIL Radio hosts the Jinglefest concert at the Family Arena in St. Charles on December 8, 2018. The concert features hot new country acts. Tickets to the concert are free and are available on a first come, first served basis at local First Bank, T-Mobile, and other participating locations. Enjoy traditional hymns and other holiday music at a special Christmas concert at St. Paul's United Church of Christ at 115 West B Street in Belleville. It's a classic Christmas concert featuring the church's Chancel Choir, B Street Band, Men’s and Women’s Ensembles, Glory Ringers (handbells), sing-along carols, and more. The concert begins at 7 p.m. on December 15, 2018. Join the fun during the Winter Fireworks Festival at Station Plaza in downtown Kirkwood on December 28, 2018. The event runs from 5 to 6:30 p.m. and includes live music, followed by a fireworks display.